AD AutoParts, Inc. warrants that each product sold shall work upon arrival and shall be free from any defects in materials and workmanship, under normal use and with periodical maintenance, subject to the terms and conditions as follows. 1 Year commencing from date of purchase: Fuel Pump Assemblies, Fuel Pumps Repair Kits, Distributors, Distributor Cap & Rotor Kit, and Ignition Coils. 90 Days commencing from date of purchase: Oxygen Sensors, Temperature Sensors, Mass Air Flow (MAF) Sensors, Manifold Absolute Pressure (MAP) Sensor, Idle Air Control Valves, Fuel Injectors, Fuel Pressure Regulator, and Spark Plug Wires. 60 Days commencing from date of purchase: Fuel Level Sending Units, Ignition Control Modules. 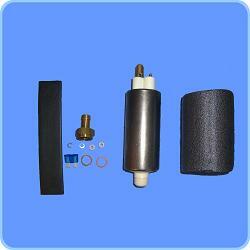 7 Days commencing from date of purchase: Fuel Filters. All other products not mentioned above are sold in an “as is” condition. No Returns, Refunds, or Warranties are offered unless otherwise specified. AD AutoParts, Inc. will pass on to its customers each manufacturer's standard limited warranty, if any. Due to the complexity of installing fuel pumps, AD AutoParts, Inc. requires all its fuel pump repair kits to be installed by a certified technician. Customer is required to show proof of installation by a certified mechanic. Any Product which has been altered in any way, improperly installed, or not used for its' intended purpose. Any costs associated with the repair or replacement of the Product including labor, installation or other costs incurred by the Purchaser, and in particular, any costs relating to the removal or replacement of any Product that is affixed to another device. Any damage to the Product due to external causes, including accident, problems with electrical power, abnormal electrical, mechanical or environmental conditions, usage not in accordance with product instructions, misuse, neglect, alteration, repair, improper installation, or improper testing. Alanis Deal's obligation under this warranty is limited to a Replacement of the defective Product. Purchaser shall be responsible for shipping costs of both the Returned Product and Replacement Product. If a direct replacement is not available the warranty will be prorated based on the length of use and will be less the original purchase price. AD AutoParts' responsibility under this or any other warranty, express or implied, is limited to a replacement, refund, or credit, as set forth above. Failure to do any and all of the above voids the warranty. These remedies are the sole and exclusive remedies for any Breach of Warranty. This Limited Warranty gives the Purchaser specific Legal Rights, and purchaser may also have other rights that vary by state or jurisdiction. Any action to enforce the terms of this Limited Warranty shall be filed and litigated in the County of San Bernardino, State of California, USA. The Terms of this Limited Warranty shall be construed in accordance with the Laws of the State of California.